The couture bridal wear designer hailed “the corset queen” has her magic scissors working overtime when visits her family home on the outskirts of London. While our photographer is setting up his first shot, Suzanne Neville, designer to the stars, whose exquisite eveningwear has graced many a red carpet, is making a few last-minute alterations to the dress she is wearing. Snip, snip – off come the sleeves and she sets to work with her needle and thread. By the time the photographer is ready, Suzanne has slipped back into a dress that, as she rightly predicted, is now infinitely more flattering on her petite frame. It’s this impeccable eye for shape and detail that has made the 44-year-old such a popular choice with brides seeking to make the most of their figures on the most special day of their lives. “For me, it’s all about fit and making a client feel good about her body,” says Suzanne, who counts TV presenter Christine Bleakley and classical crossover singer Katherine Jenkins – longtime fans of her evening gowns – among the famous brides who have chosen her to make their wedding dresses. Warm and passionate but with a gentle and calming presence, it’s easy to see why Suzanne forms such close bonds with her brides. Twenty five years after she started her business – from a small studio in her parents’ back garden, where she created her first collection with the help of a grant from The Prince’s Trust and a loan from her grandmother – Suzanne still designs every gown herself and is at the first fitting of every bride who visits her Knightsbridge showroom, where she is assisted by her “wonderful, talented” team. “I’m so lucky to have them, from our PR and admin teams through to our amazing pattern cutters, seamstresses and embroiderers,” she says. All the dresses she designs “feel part of me”, she adds. “Within five or ten minutes of chatting to a client I can picture the gown she wants to create. Often, I’ll be sketching as she’s talking. I wouldn’t ever want to relinquish that part of it because it’s my passion. Or maybe I’m just a control freak,” she says with a burst of laughter. Suzanne poses for HELLO! after making some adjustments to her dress, namely dispensing with its sleeves. Not surprisingly, her wedding dress, which she designed herself, flattered her petite frame perfectly. Her business got its first break after a canny Suzanne, aged just 20 and having created her first collection after graduating from the London College of Fashion, persuaded family and friends to call the bridal department at Harrods posing as potential customers and ask if the store stocked a new designer called Suzanne Neville. Her first celebrity client was model Rachel Hunter, who wore a beaded gown in the palest gold silk to renew her wedding vows with her then husband Rod Stewart in 1995. 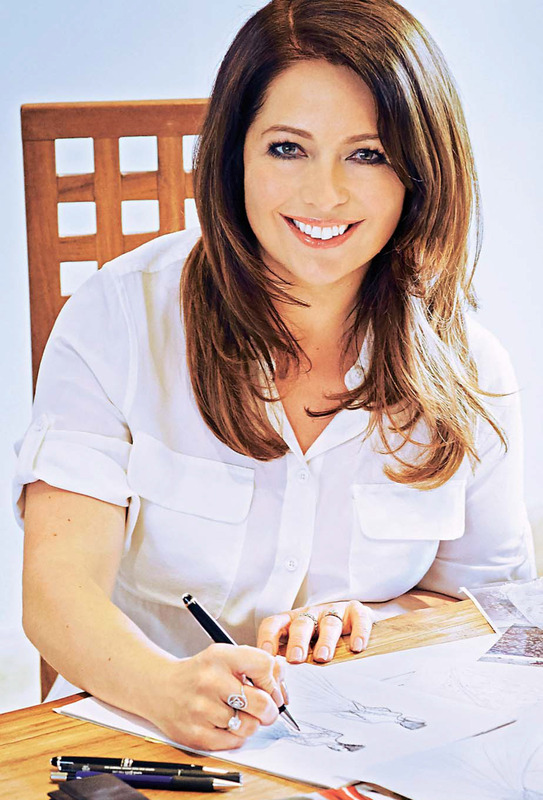 Since then, Suzanne, who credits her business partners – husband and wife team Jane and Major Tony Hampton – with helping to drive the brand forward in the UK and internationally, has built up a loyal celebrity following, with stars including Kate Winslet, Holly Willoughby, Tess Daly, Rochelle Humes, Darcey Bussell and Kirsty Gallacher flocking to wear her divine couture creations, showcased in her Knightsbridge and Cheshire boutiques. With Christine Bleakley and Katherine Jenkins already fans, did Suzanne know she had it sewn up when it came to designing their wedding dresses? But the floor-sweeping silk organza gown, hand-beaded with Swarovski crystals and pearls, that the mezzosoprano wore when she exchanged vows with American artist Andrew Levitas in September 2014 was a real showstopper. “I fitted her into her dress and she looked and felt amazing,” says Suzanne. Similarly, Suzanne helped Christine put on her gown last December when the presenter married former England and Chelsea footballer Frank Lampard, who plays now for New York City FC. “Because Christine was spending so much time in New York with Frank we were limited on how much time we had with her, so the finishing touches were only made in the week before the wedding,” reveals Suzanne. “But she’s such a joy to work with – so chilled and just a gorgeous person in every way. She’d tried on a few designs at the start and told me what she liked about them then left me to sketch some ideas. I was delighted when she saw the final design and loved it. But the enduring memory of the day for me was the speeches. Having got to know Frank and Christine as a couple, hearing the way they spoke about one another was very moving. 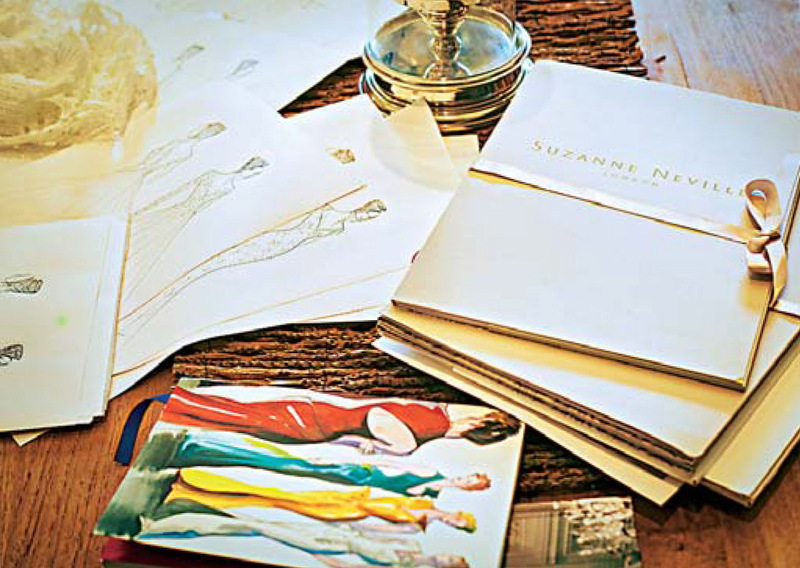 Noted for her eveningwear and bridal collections, Suzanne’s initial sketches form the basis of all her designs. In recent years she has designed wedding dresses for Christine Bleakley (with husband Frank Lampard) and Katherine Jenkins (with husband Andrew Levitas). View more Celebrity Wedding Dresses by Suzanne Neville. 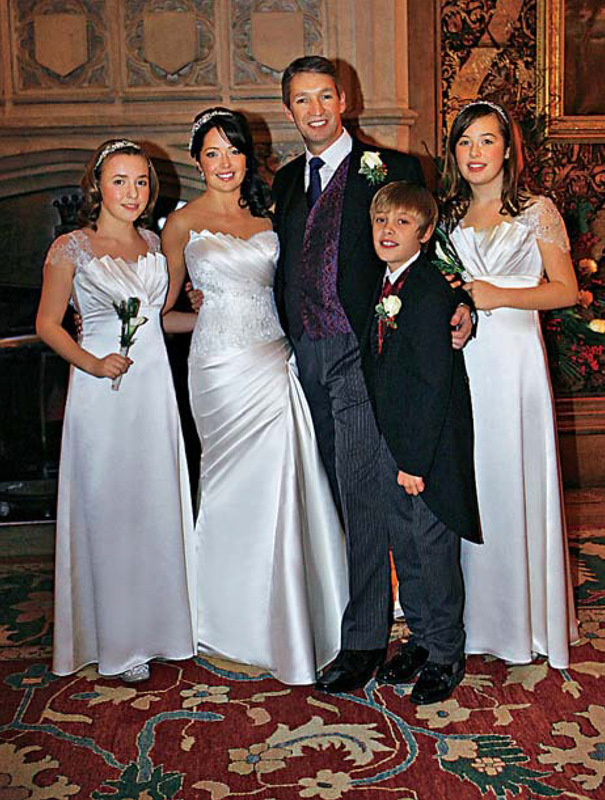 Suzanne shares her “happy home” with her husband Richard, her daughter Abigail and son Stephen (above) and Richard’s daughter Gabrielle. The dream wedding gown Suzanne found hardest to create was her own. In December she will celebrate six years of wedded bliss with her husband Richard Moir, a chartered engineer and director with Highways England, whom she met online in 2009. 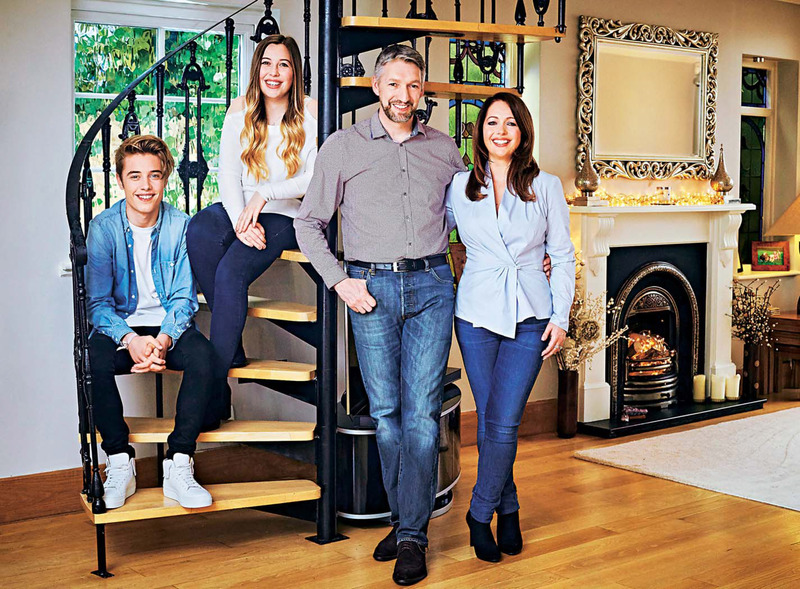 “I’d got to a stage in my life where I felt ready to meet that special someone but, when you’re working so hard, where do you start?” says Suzanne, who lives with Richard, her daughter Abigail, 18, son Stephen, 15, and Richard’s daughter Gabrielle, 17, who’s away at a luxury spa the weekend of hello!’s photoshoot. The spectacular venue of Highclere Castle, made famous by ITV’s Downton Abbey, was the setting for the wedding, which Suzanne admits was mainly planned by Richard because she was busy with work. Richard declares himself “immensely proud” of what Suzanne has accomplished with her business. With the 25th anniversary of her business looming and her latest set of designs, entitled the Portrait Collection, taking to the catwalk at shows in the Tower of London this month, does Suzanne have any famous brides-to-be in her sights? “I’d love to dress Adele,” she tells hello!. “She has fabulous curves and would look sensational. I don’t think she’s married yet, is she? Come on Adele, get on with it!